In Turkey there is something for everyone. Looking for a break in the sun this year? 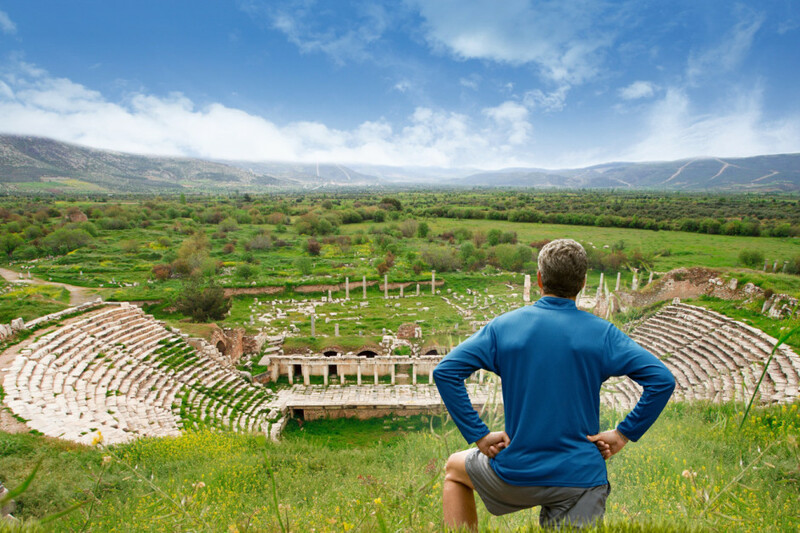 Turkey offers a mix of the classic beach holiday, historic sightseeing, exciting nightlife and city breaks – there really is something for everyone! Fethiye is a small town on the Turkish coast, home to the beautiful resort village that is Oleduniz – otherwise known as the blue lagoon. This beach is one of the most popularly photographed in the world, and for good reason. However, photos tend not to do the breath-taking vision of the lagoon justice, regardless of the beauty of the picture! Situated next to an array of bars and restaurants on the promenade and water sports including jet-ski hire and paragliding available, Oleduniz is undeniably a top beach destination in Turkey. Istanbul is your ideal Turkish city break with the mix between Europe and Asia influence creates a diverse atmosphere where ancient mosques and traditional Turkish markets blend with modern restaurants and bars. Experience the vibrant culture by getting lost in the Grand Bazaar street market or visit the must-see Blue Mosque during the day before hitting Beyoğlu at night – Istanbul’s nightlife hub with numerous clubs, bars and live-music venues. With an abundance of music bars and night clubs Marmaris and Bodrum are ideal for the lively holiday with a party in mind. With streets full of colourful bars and restaurants you will never be far from live music, karaoke or dance beat from the local clubs. As Turkey’s capital city, Ankara is filled with a selection of ancient sights, monuments and museums, making it an interesting representation of the history of the country whilst still existing as a vibrant and cosmopolitan city. Sights that you undeniably can’t miss include the Mausoleum of Ataturk, a powerful memorial tomb of the Father of Modern Turkey, and exploring Ankara Citadel with many archaeological sites and a birds-eye, panoramic views of the city. Until the discovery of Göbeklitepe in 1963, Stonehenge (3,000 BC) was believed to be the oldest manmade place of worship on Earth. But at 12,000 years old, Göbeklitepe pre-dates that by about 6,500 years. Göbeklitepe’s Neolithic megaliths are still being excavated (only 5% of the site has so far been unearthed), and you can see the archeologists’ finds—from pillars carved with ancient animal motifs to hieroglyphic inscriptions older even than the Sumerians’—onsite. 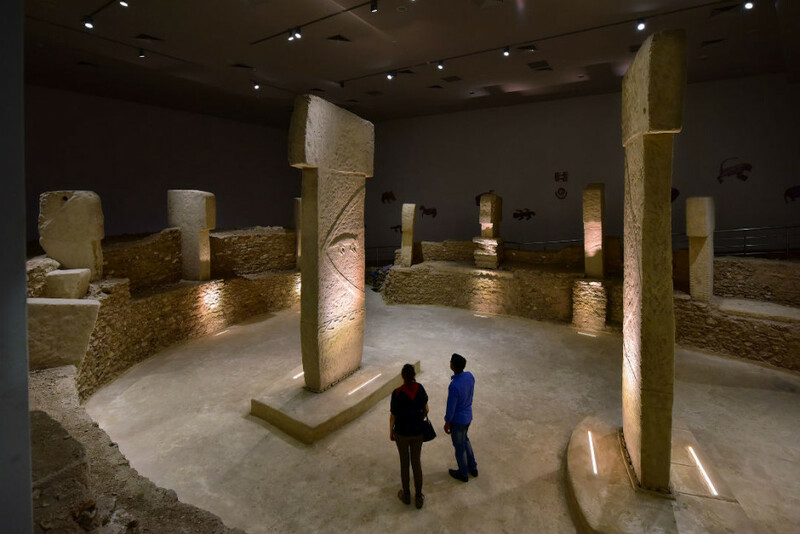 Göbeklitepe’s findings are also on display at a special chamber in the recently-opened Şanlıurfa Haleplibahçe Museum, where a replica of the sacred site has been created. 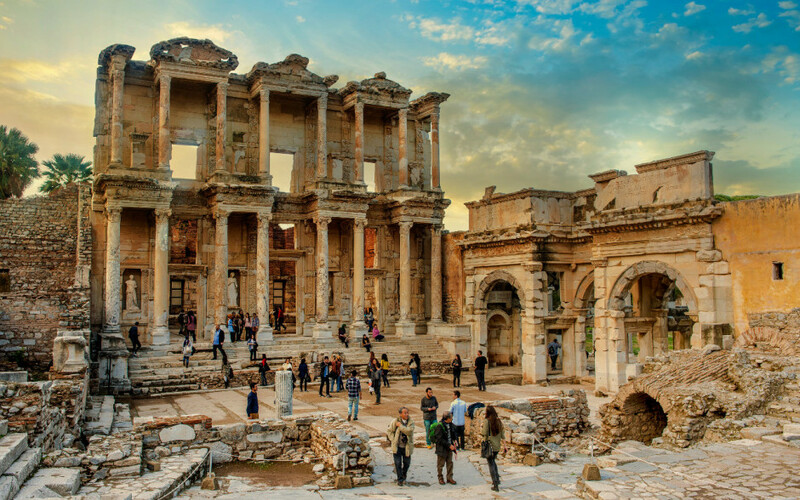 Ephesus was the Roman capital of Asia Minor, and home to over a quarter of a million people—from slave traders to saints—at its peak between 1 AD and 2 AD. The site of the Temple of the Artemis, which was one of the Seven Wonders of the Ancient World, 150 years of excavations at Ephesus have revealed the most complete Greco-Roman classical city on Earth. No wonder it was just added to the list of UNESCO World Heritage Sites. 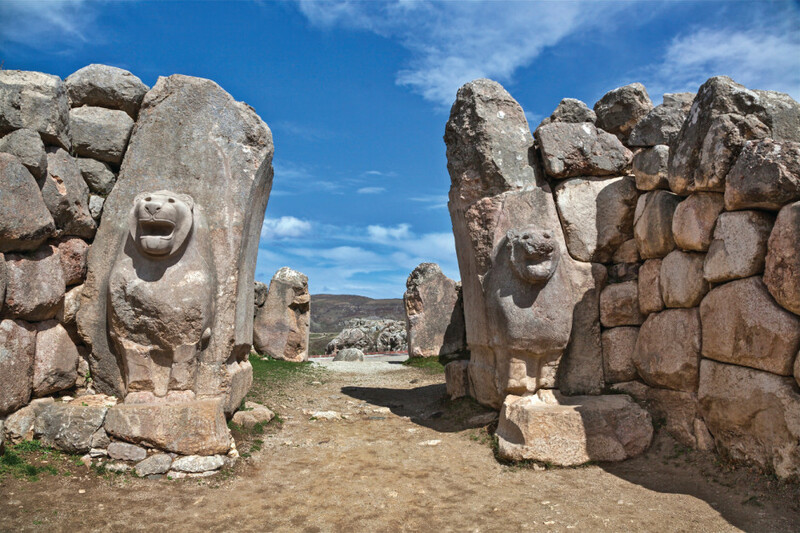 Hattusha is one of Turkey’s great ruins, and was once the capital of the Hittite Empire. A UNESCO World Heritage Site, it was founded in around 1600 BC, then conquered and mostly destroyed after 1200 BC. Since then, the ruins have been well preserved. From ornate gateways, such as the Lion’s Gate, to temples, royal homes, and ancient fortifications complete with underground passageways, it’s hard to be bored wandering around what once was the region’s mightiest city. Hattusha is the site of the world’s earliest peace treaty, the Treaty of Kadesh. The clay tablet containing the text of this treaty is displayed at the Istanbul Archeology Museum. 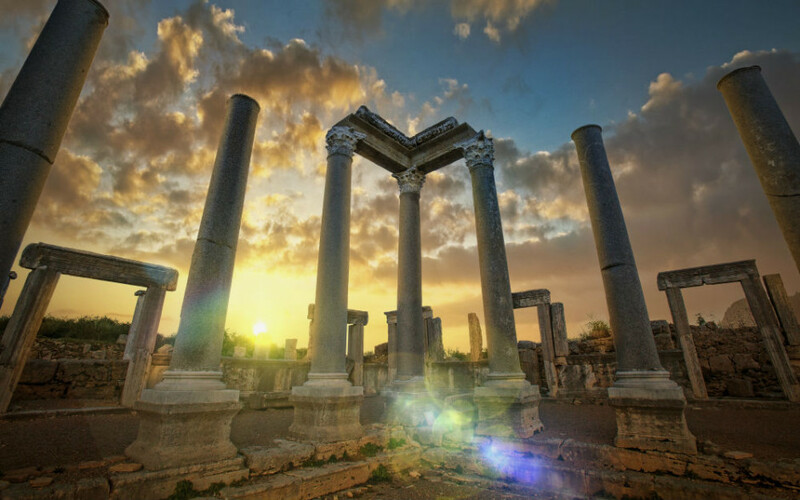 Founded in around 1000 BC, the ancient city of Perge, near present-day Antalya, was captured by the Persians and then, around 333 BC, by the armies of Alexander the Great before becoming part of the Seleucid Kingdom. Then came the Romans in 188 BC. They built most of the sites you can see today, including a theater big enough to fit 15,000, a public square, gymnasium, and necropolis. Also found here are the remains of Roman baths, the city’s imposing gates, and a 2nd-century AD nymphaeum. Recent excavations at Perge have revealed 13 ancient sculptures, including the only complete sculpture of Emperor Caracalla to date, a 6ft rendition of moon goddess Selene, and goddesses Nemesis, Aphrodite, Athena, and Tykhe. 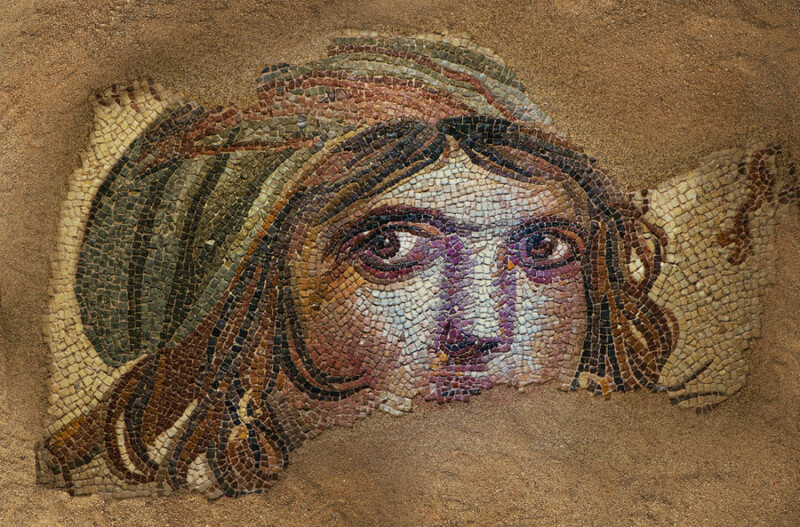 Part of the Gaziantep Museum of Archaeology, the Zeugma Mosaic Museum contains a vast collection of restored mosaics from the Ancient Roman town of Zeugma, which is about 27 miles away from the city of Gaziantep. Founded in around 300 BC by Alexander the Great’s general Seleucus I Nicator, Zeugma was a vital military and commercial center with as many as 70,000 residents at its peak, until devastating attack under order of Sassanid king Shapur I in 256 AD led to the town’s decline. Today, 25% of Zeugma lies underwater due to the construction of modern dams. The items on display in the mosaic museum were uncovered during excavations in the ’90s, and more discoveries of wall paintings, mosaics, and frescoes that once decorated Roman residential villas are still being made. On your visit to the museum, keep a lookout for the haunting eyes of the “Gypsy Girl” (above). Phaselis—located near Tahtalı Dağı, which in ancient times was known as Mt. Olympos—was once used as a base by a powerful groups of pirates (including the much-feared Zeniketos). The city was abandoned entirely by the 15th century AD, but much of the original Lycian site remains intact. Visitors should also check out the natural-gas-fueled dancing flames constantly burning on the nearby mountainside of Çakaltepe (above). Legend credits the spectacle to the mythical beast Chimera, depicted in Homer’s Iliad as a fearsome creature of “race divine, made up of lion, dragon and of goat, her jaws emitting dreadful flames.” Today, Olympos is an important center for outdoor tourism in Turkey, with nearby treehouse accommodations catering to outdoorsy travelers. 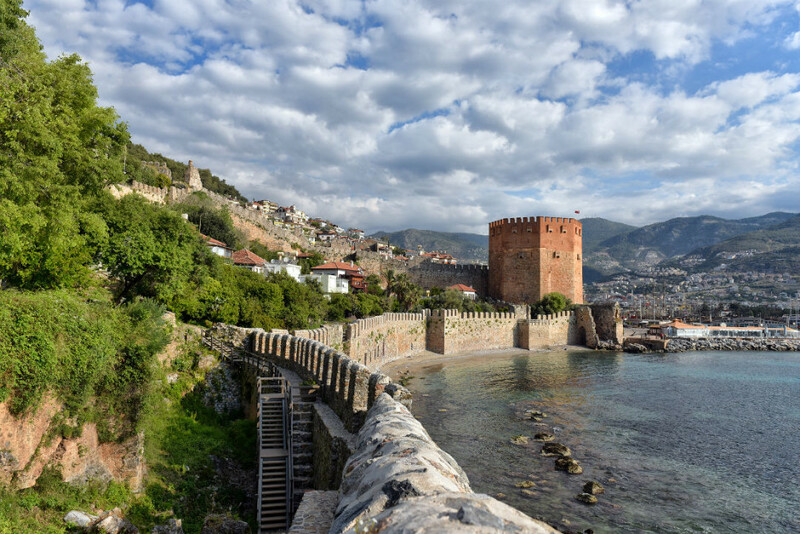 Alanya Castle is a Seljuk ruin sitting atop a high peninsula overlooking the sea. There’s nearly four miles of defensive walls, reinforced by 140 ramparts and 400 cisterns; it was once one of the most well-defended cities on the Mediterranean. On a visit to the castle, you can see the palace of Alaaddin Keykubat, a number of mosques (including the 16th-century Suleymaniye Mosque), and a church. Also within the walls is a mansion once owned by a former US ambassador to Turkey, and which now houses Georgetown University’s McGhee Center for Eastern Mediterranean Studies. The Castle Citadel, which dates to the 6th century, has a platform where you can get spectacular views of the peninsula. The Blue Mosque (Sultanahmet Camii) was the ambitious creation of 19-year-old Sultan Ahmed I—he began the project in 1609, and today it’s one of Istanbul’s most iconic sites. Ahmed I wanted to build a mosque to rival the Hagia Sophia. When it was finally completed in 1616, the Blue Mosque, with its increasingly large domes, grand minarets, and blue tiles adorning the walls, indeed achieved this. Ahmed I died just one year after his Blue Mosque opened. The mosque’s interior is lined with over 20,000 handmade ceramic tiles—they were made in the city of Iznik (Nicaea) according to more than 50 different tulip designs. For almost 500 years, Istanbul was the seat of the mighty Ottoman Empire, and for much of that time, the Ottoman sultans resided in Topkapı Palace. Much more than just a single structure, the Topkapı complex comprised a hospital, mint, and multiple mosques, and was home to thousands of people. When the empire came to an end in the early 1920s, the palace was transformed into a museum dedicated to the Ottoman era. It also contains important religious relics. 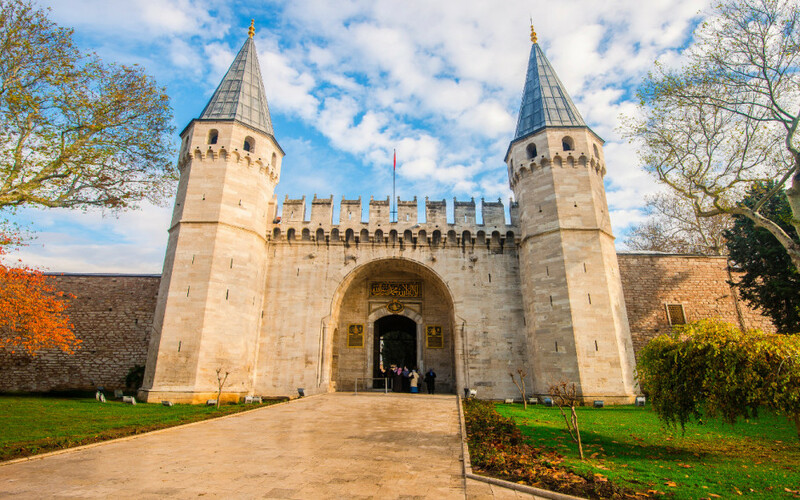 You’ll find Topkapı right at the tip of Istanbul’s Historic Peninsula, one of the key sites that make up the UNESCO-listed Historic Areas of Istanbul. 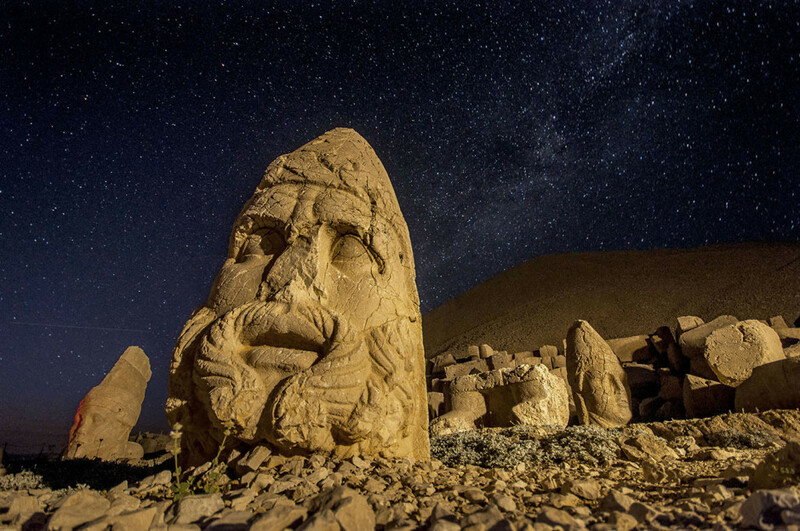 Nemrut, also known as Nemrud, stands at over 7,000 feet and is the site of the 1st-century BC mountain-top tomb of King Antiochus I Epiphanes. It’s famous for its 30ft-high statues depicting various mythological figures, all of which have seen their heads topple from their bodies. This UNESCO-listed site is best visited at sunrise or sunset, the ideal time for admiring and photographing the still-life population. 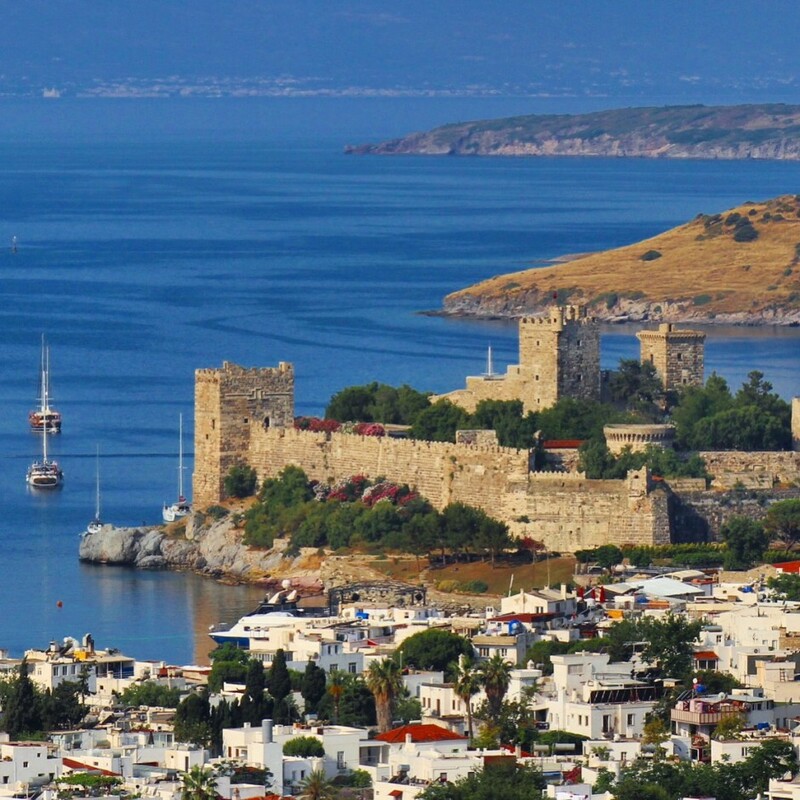 Bodrum Castle, aka the Castle of St. Peter, was built starting in 1402 by the Order of the Knights of Saint John, who were seeking safety from the invading Seljuks. The urgency of the job is evidenced by the fact that the walls of the castle were strengthened with materials pilfered from the nearby Mausoleum at Halicarnassus. The castle is open to the public, and contains the not-to-be-missed Museum of Underwater Archaeology. Cappadocia’s Göreme Open Air Museum has about 30 ancient churches, and it’s about as far from a traditional museum as it’s possible to get. Within the haunting landscape of stone pillars, the roughly cut rock churches—particularly those of the Dark Church and the Church of the Buckle—contain some of the best-preserved frescoes in Cappadocia. 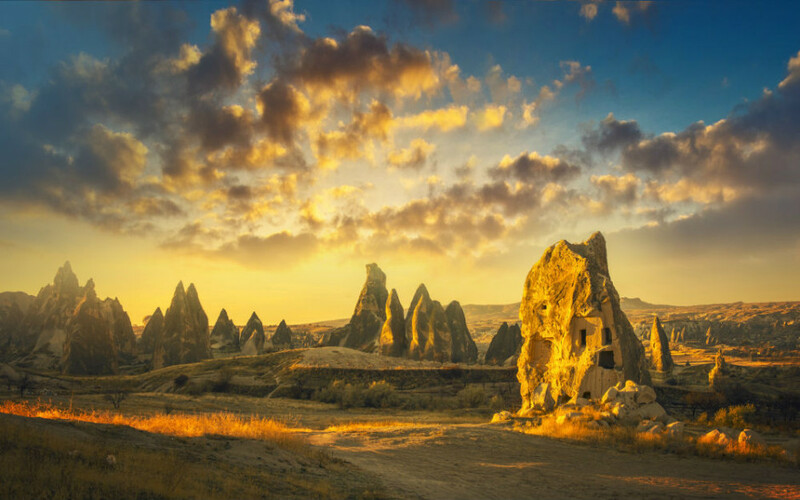 By the end of the 2nd century AD, the Göreme Valley had been transformed into a hub of Christian activity, with converts fleeing persecution drawn to the area’s natural defenses, including entire settlements underground. Yet another underground city has recently been discovered at Cappadocia, and archaeologists believe it could be the largest subterranean city ever known. Dating back 5,000 years, with corridors running as deep as 371 feet, this newfound labyrinth is believed to be the size of 65 soccer pitches. According to Greek geographer Strabo, in the 1st and 2nd centuries BC Myra was one of the Lycian League’s most important cities. Today in Myra, a collection of mostly Roman ruins remain, including the acropolis, an amphitheater, and Roman baths. Among the more noteworthy structures are two tombs that have been carved into cliff faces (the best known is Lion’s Tomb, where there are 11 life-sized figures in relief on the wall). However, Myra is perhaps most famous for its Church of St. Nicholas (as in St. Nick, as in Santa Claus)—he was actually the bishop of Myra in the 4th century AD. The Aspendos Roman Theatre was first written about by the Hittites in 800 BC. Able to seat up to 15,000 people, the amphitheatre was once part of the city of Aspendos, founded by Ancient Greeks from Argos. 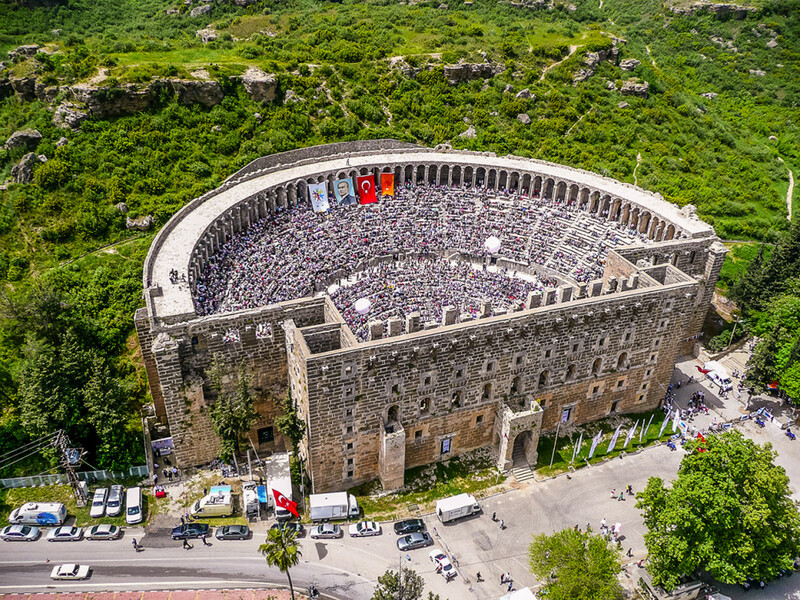 In modern times, it plays host to the annual Aspendos International Opera and Ballet Festival. 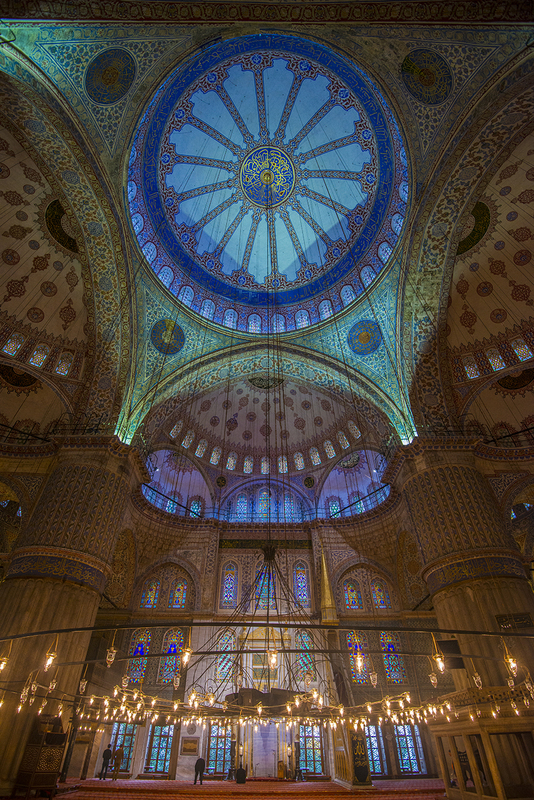 The world-famous Hagia Sophia is a 6th-century church-turned-mosque in Istanbul, and today it’s a museum. Originally built in the 4th century AD by Constantine the Great, little remains of the initial structure, or the one built after it in the 5th century. What visitors now see dates to between 532 and 537 AD, raised in the Byzantine style under order of Emperor Justinian. 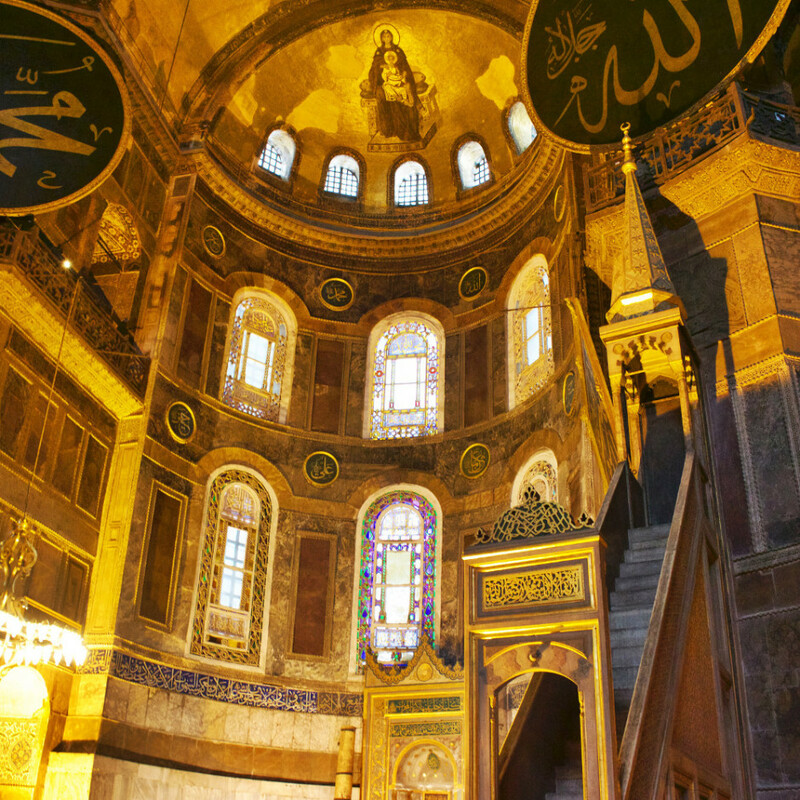 The Hagia Sophia served as a religious center for the Eastern Orthodox Church, but the building was converted to a mosque in 1453 under Sultan Mehmed II when Constantinople was conquered by the Ottoman Turks. It was during its time as a mosque that many dominant architectural features were added, including the minarets and the mihrab that make the Hagia Sophia such a visually stunning mixture of both Muslim and Christian influences and architecture. 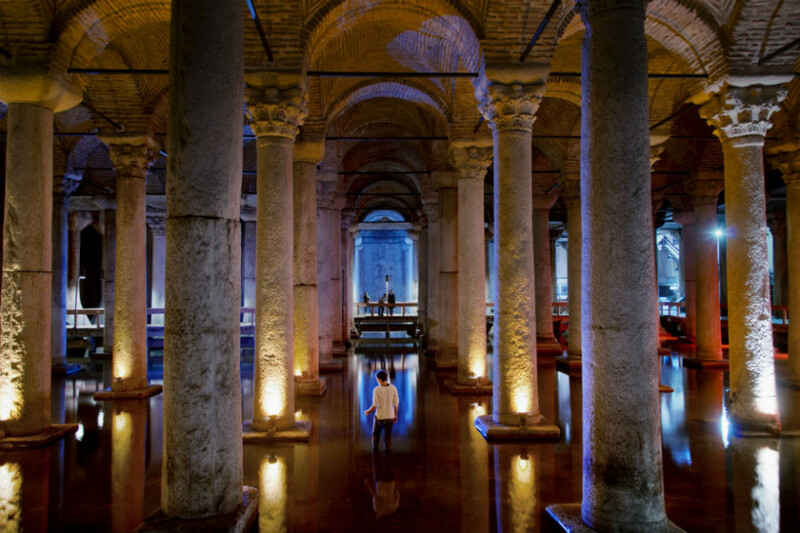 The Basilica Cistern (Yerebatan Sarnıcı) is an eerie underground wonder and one of the biggest surviving Byzantine sites in Istanbul. Tread its raised platforms to view 336 marble columns (two depict the head of Medusa, which you’ll remember if you read Dan Brown’s Inferno) and take in the spectacularly vaulted ceilings that still drip moisture in this former water storage chamber built by Byzantine Emperor Justinian in around 532 AD. The deserted town of Kayaköy, perched high on a hill, was largely ignored for most of the 20th century, and has only recently made its mark on the tourist scene thanks to its connection to the novel Birds Without Wings by Louis de Bernières. The novel is set in the fictional village of Eskibahçe, which is based on Kayaköy. The town is also used in the 2015 film the Water Diviner with Russell Crowe. The once-bustling settlement is now an open-air museum consisting of almost 500 rundown houses along with the remains of two derelict churches. The atmosphere is surreal. The remains of ancient Simena, now modern Kaleköy (just inland of Kekova Island), form one of the most impressive historical sites in Turkey. Simena sits below the remains of a Crusader castle, and many of the ruins, some dating as far back as the 4th century BC, have been partly submerged in the Mediterranean since a series of coastal earthquakes 1,800 years ago. 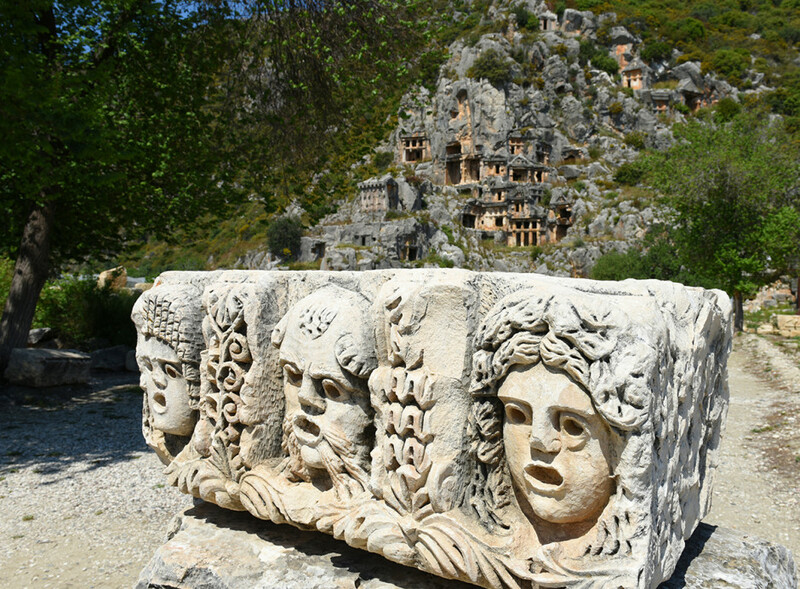 It’s also home to a Lycian burial ground, and huge sarcophagi are scattered along the nearby hillside. 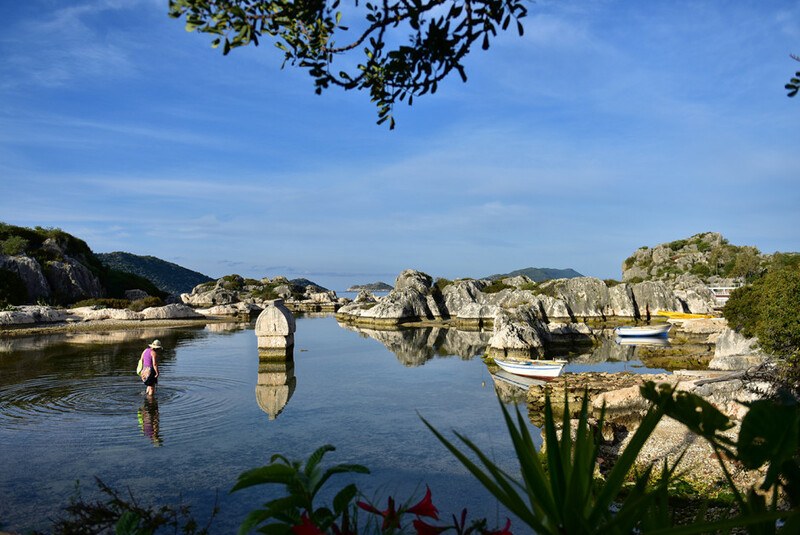 Simena is a protected site, but visitors can explore the Lycian tombs and half-submerged houses protruding from the water by taking a boat tour, renting a canoe, or even contracting a yacht. 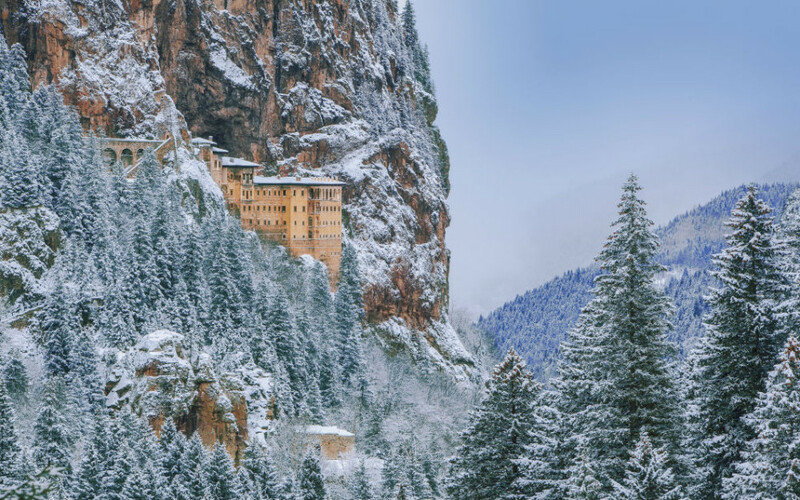 Take the steep path and staircase through the forest in Altındere National Park and you’ll eventually come to Sumela Monastery, a Byzantine monastery dedicated to the Virgin Mary. It sits atop the extreme edge of a sheer cliff face some 300 meters high. The monastery was founded around the 4th century AD by Barnabas and Sophronius, two Athenian priests who traveled through the region during the reign of Theodosius I. The story goes that they discovered an icon of the Virgin Mary, believed to have been the work of Apostle Luke—legend said it was brought to Trabzon’s Pontic Mountains by angels. The monastery ceased operations in 1923 and was subsequently turned into a (very picturesque) museum. During the Hellenistic, and Roman periods, the small city of Aphrodisias, named for the goddess Aphrodite and located in southwestern Turkey, was a major source of marble. The stone was quarried from nearby hills and shipped all over the Ancient World for use in building facades and sculptures. A number of master sculptors consequently made their home in Aphrodisias, and much of their work has been unearthed and is displayed in the onsite museum. This entry was posted on February 11, 2016 by Martin.